Youre going to pay $5k for that engine!!! Dude, please PM me your contact info. I have a bunch of stuff I want to sell you! looks like a crack at the bottom of the cylinder? 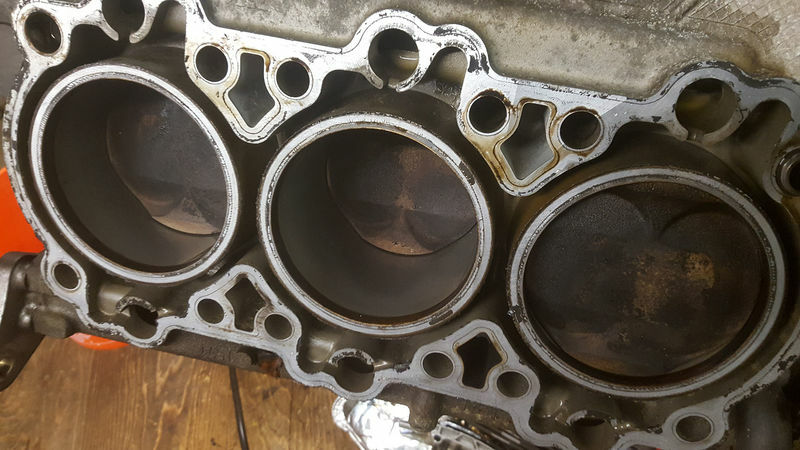 perhaps just more broken piston? regardless, need for new sleeves and to deal w big chunks of metal flying around the bottom end. my price was premised on bad crank as stated in the post. i was also talking Cdn $; presume you understand that, although called 'dollars', they are not the same as american $. yes, you may be able to 'shop around' for better pricing, but should avoid confusing shopping around with doing things half-arsed, such as only sleeving the damaged cylinder, filing the burrs off the crank and slapping it back in, etc. $5k is a good price, newart should take it quick. It is always easy just to assume everything is broken and spend way more than necessary. Break it down and analyze parts individually. ....is what NASA refers to as "Non-Intact Recovery." She dun blown up real good. You know, I was actually thinking about the shuttle and the incredible post-accident investigation just earlier as I was posting on this. Just pull out all that broken stuff and bolt it back together as a 3.0L 5 cylinder. The bigger issue would be balance, and the car would vibrate apart methinks given its a flat 6. Check engine light would probably be on with a million codes running on 5 cylinders, ha ha! Is it time for an update on the Youtube channel? I know this is not a happy moment, but a video tour of the engine carnage would be very informative to those of us who follow. Yes, I am documenting the 996 teardown. I will post it on my YouTube channel when I have split the case. Cylinder Liner Cracks: In an effort to reduce costs during production, Porsche utilized a type of insert-mold casting process to directly incorporate Lokasil cylinder liners into the case. While this is a neat way to reduce the total number of parts used in the engine, this design basically casts a wearable part into the engine case. There is no factory replacement for the liners: when they wear, the factory expects you to buy a new engine case. 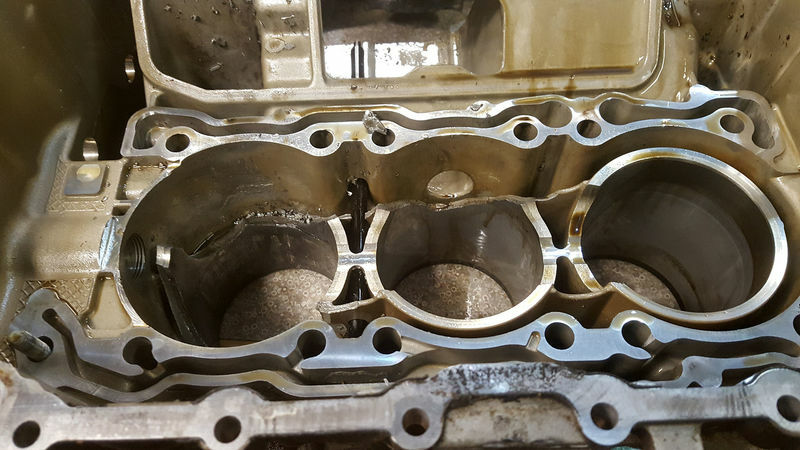 In addition, the design of the cylinder liners allows them to "float" within an area filled with coolant. Excess vibration and twisting from the normal operation of the engine appears to be causing some cracking in these liners, resulting in a small chunk of the liner breaking off. This "D-chunk" problem seems to ironically occur mostly in gently driven cars. Boxsters that are driven hard at the track or on the street do not tend to see this type of damage. At least with respect to the track cars, one theory is that these cars tend to have their oil changed much more often. The problem affects mostly the 2.5 and Carrera 3.4 engines: the 3.2 Boxster S engine appears to be unaffected because it has thicker cylinder walls than the 3.4 engine. When this failure happens, you will see oil and coolant begin to mix together, or a slight unexplained coolant loss. Wow that must have been some knock before the engine blew! Do you understand what happened? My understanding is the IMSB problem should have thrown the timing off, leading to pistons hitting valves and then other bad things. But you say the heads and valves are OK??? Perhaps you can find a used case half ? Are cases a matched pair ? Size, obviously, sure, but wonder if you can find just a used half. Last edited by Blackroot; 01-31-2019 at 11:23 PM. Case halves are matched, so no go for mixing them. The link that you posted is for re-sleeving, so it needs a core, one of which I have not.